Art teacher, artist, archer :). Passionate about sharing knowledge and experience towards people discovering their own creative abilities. When it doesn’t work you can let the magic in. Well, I haven’t managed to keep up with my idea of doing a sketch a day but I am happy with some that I’ve done. Happy because I love the doing, happy because I did it, happy because they’re not too bad. However one particular sketch didn’t go so well. After lunch I took out my sketch book. I started drawing one of the buildings and it just wasn’t working. Perspective and proportions were out and windows were drawn from what my head was telling me rather than my eyes. Then the magic started. 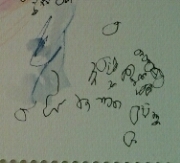 My unsuccessful beginning of a pen sketch was turned into a canvas for my three gorgeous grand nieces to explore. I showed Imi how to first put the colour down and then paint over it with the waterbrush. What a pleasure for me and her. 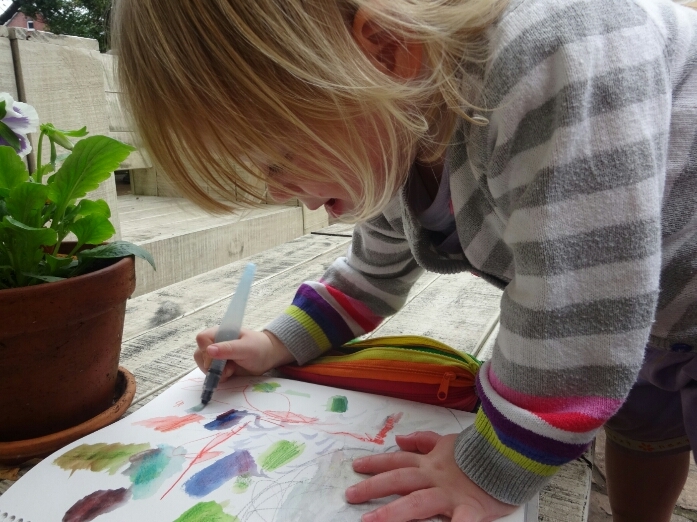 Drew, Imi’s twin, preferred the black pen and with beautiful pen holding skill drew fine, careful words. I would love to understand the story she wrote. I was pleased to redeem my belief in my ability the next day. Whew! A few days ago I visited Tate Britain. This is where Turners bequest is housed and, happily, where a new exhibition of later works has just opened. I followed the signs to the Turner wing, not realising that I was completely missing the main entrance with maps and information. It was like creeping into the secret back entrance. There was no grand reception just some well placed signs to point me in the right direction. I hadn’t realised how large the works in oil are. Enormous canvases depicting great battles, mythical stories, storms and historical events – sometimes all in the same painting. His colours, brushstrokes and techniques were/are wondrous. However the wonder, for me, is in his brilliant watercolours. No wishy washy feint marks. 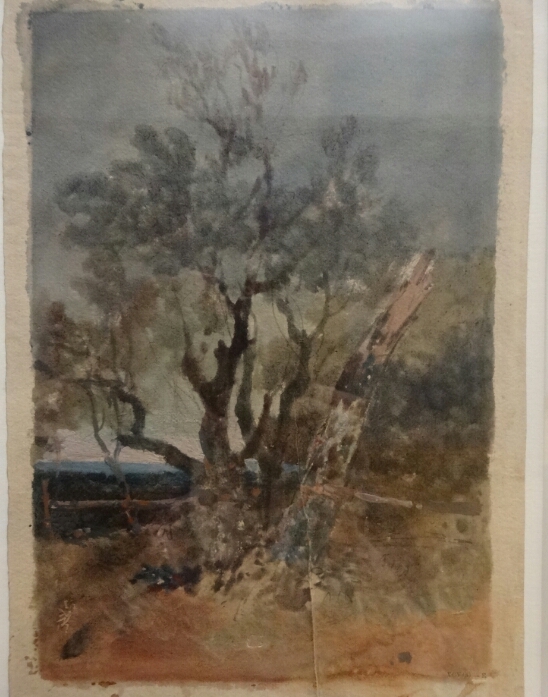 (How did watercolour ever get its bad reputation for insipid colours with Turner setting the benchmark?). I was also excited to see his use of mixed media. Whatever gave him the effect he wanted he used. 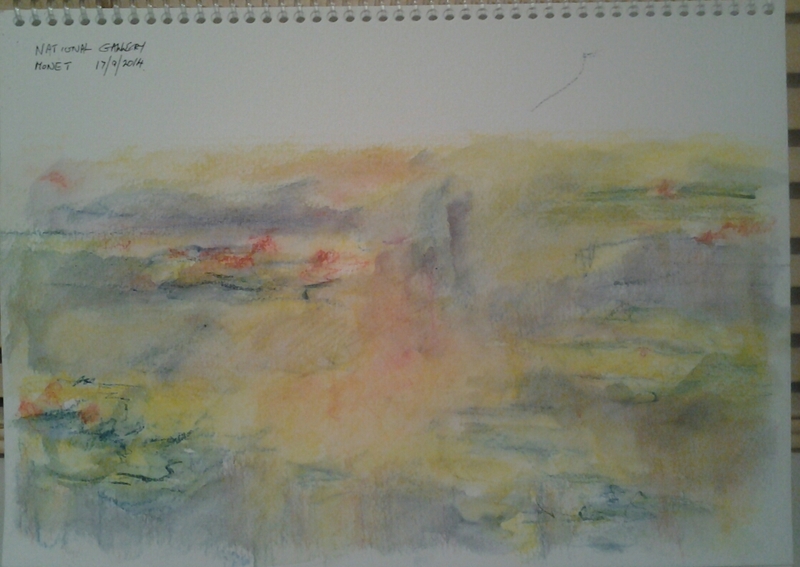 Chalk, graphite, watercolour and body colour (guache). 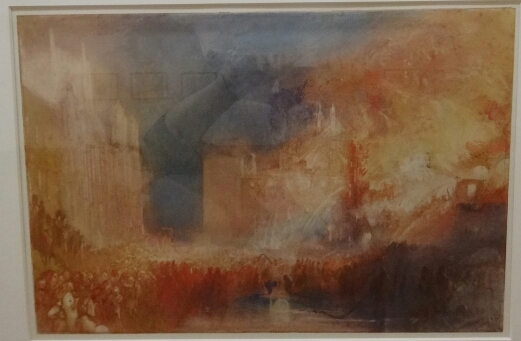 Although photos were allowed in the main section (not in the new exhibition) it is obviously difficult to take decent photos of work under glass so do yourself a favour and explore google images (or printed books) of Turner’s work. 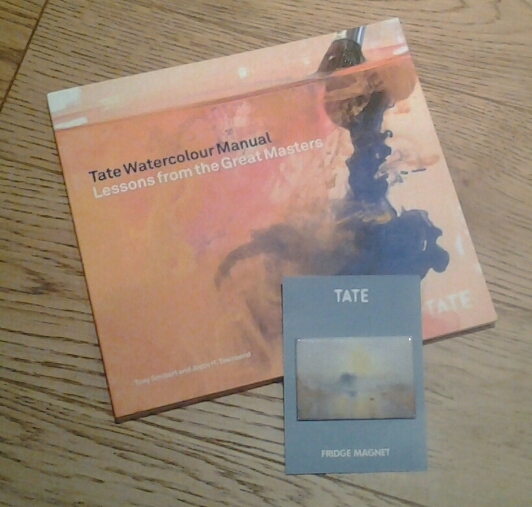 I made some purchases including a book partly written by wonderful Australian artist Tony Smibert who works with the Tate as a Turner specialist. Inspiration to bring to my studio when I get home. I’m in London for the first time in 33 years! My knowledge and interest in art was only vague then, and now, I am revelling in the opportunities that abound. I’ve also made a pact with myself that I will draw/sketch every day if possible. I’d like to share them with you too. I visited the National Gallery on Wednesday afternoon after spending the morning in Covent Garden with my nephew who works near there. My main interest lies in the 18th to early 20th century work so I headed there. Turner! There was a tour guide talking about the painting and I caught the tail end of his passion for the subject. 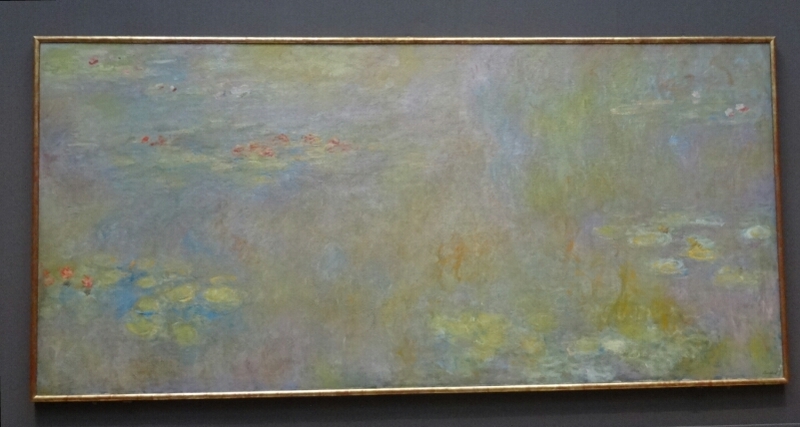 I moved to the next room and Monet’s Water Lillies beckoned. How amazing to be in the presence of such wonderful art. To see the brush strokes, to see colours I had not imagined were there. Mauves, oranges and phthalo. I was bursting with the immensity of it all. Free to experience and photograph. It was almost overwhelming. I then did something I have never done before, had never had the opportunity or urge to do before. I sat on the broad wooden bench and took out my sketch book. With 4 watercolour pencils (scarlet red, cadmium yellow, warm blue and indigo) and my trusty waterbrush I worked in my watercolour sketchbook. (300gsm paper). 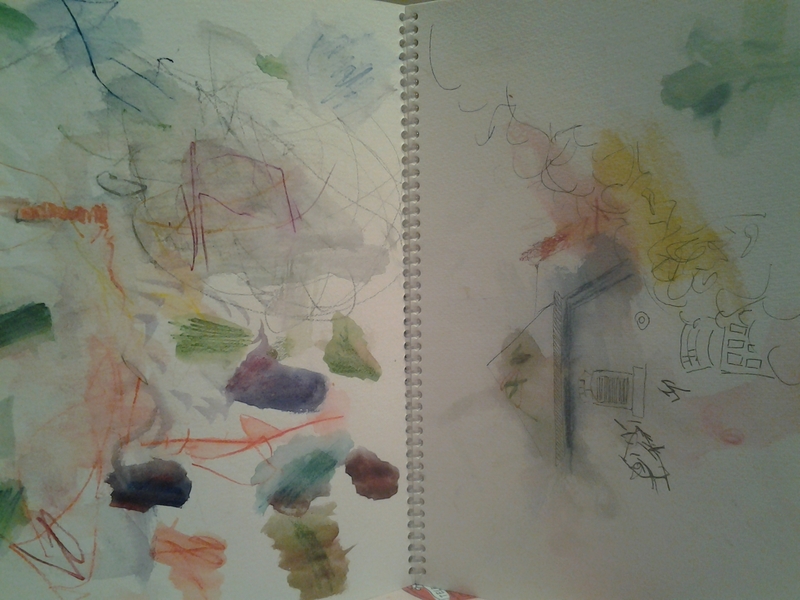 My waterbrush soon ran dry as I had used it for a previous sketch and had not thought to fill it up. So… I used the next best supply of liquid – my mouth! It wasn’t particularly successful but I was reluctant to break the inspired energy. Finally I decided that I did need proper water and sought out the cloak rooms. On may way there I passed through the next two rooms awaiting me – Cezanne, Van Gogh and more! They would have to wait. Indeed, I was too awed to continue once I’d completed the sketch and will definitely return to spend some more time with my new mentors. Why do we do art? A post from my my first blog before I changed to this one. Why do we do art?. Quick Tip#7 – Coffee Anyone? Cafe style coffee is delivered to the studio every day by Gabriel of Kiss Cafe. He is usually met with gasping relieved sounds of creative types waiting for their espresso coffee fix. Donald’s is double strength in half a cup of water! It tastes perfect, smells wonderful and looks good too. 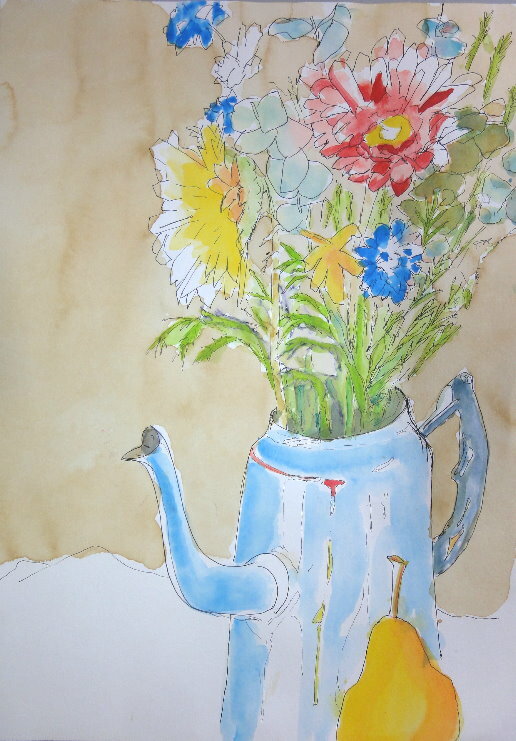 Donald is a regular student to the studio and his beautiful pen and wash drawings continue to improve and charm us all. Most of his work is done with a black waterproof ink pen with a wash of vibrant colour from a palette of Derwent Inktense blocks….. and the recently discovered perfect background colour – coffee! Drink the coffee until there is about one cm (half an inch) in the bottom of the cup. Wash the golden brown into the damp areas creating a gentle wet in wet background. Let the piece dry naturally. Don’t use coffee with milk. It’s not the correct colour, isn’t gloriously translucent and the milk will probably turn sour before you can brew your next cup. In a pinch you can make up some black coffee with instant coffee and boiling water but it doesn’t quite have the same style.